D'Addario EPBB170 Phosphor Bronze acoustic bass strings are acclaimed worldwide for their great, long-lasting tone. 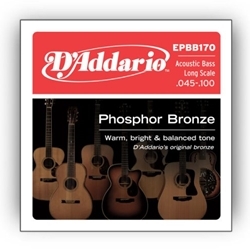 Phosphor Bronze was introduced to string making by D'Addario in 1974 and has become synonymous with warm acoustic tone. D'Addario is the world's largest manufacturer of strings for musical instruments. Many top guitarists won't play any other brand.